How Many AWR Shortwave Sites Have You Verified? Ever since Adventist World Radio was inaugurated way back more than 40 years ago, listeners in many countries on all continents have looked forward to participating in the annual DX contest. Our historical records show that the first listener contest was conducted by the fledgling new AWR back during the year 1972, just a few months after the official inauguration on October 1, 1971. 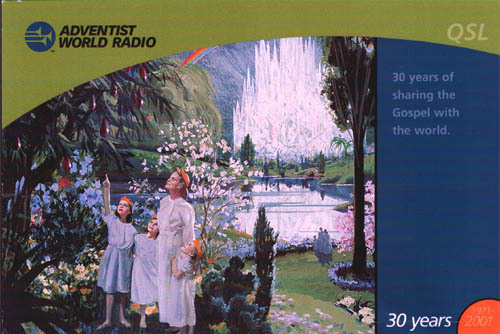 The longest series of annual DX contests began under the original Adventist World Radio in Asia, AWR-Asia in Poona India, and these were introduced just a few years later, in 1977. Since then, this well established AWR DX program has transmigrated from Asia to the United States, and the name likewise has evolved into the now familiar “Wavescan”. Throughout all of these intervening years, the annual winner’s list contains the names of well known international radio monitors living on all continents. In addition, the long roster of regional winners over the years includes a host of names, international radio monitors living in up to a hundred different countries. Any and all entrants have an equal possibility of winning one of the many awards that are available each year. A. How Many AWR Shortwave Sites Have You Verified? * Where possible, please copy any three of your AWR QSL cards, preferably in color, though black and white can be acceptable, and enclose with your contest entry. * Which is your best AWR QSL card? Explain why in one short paragraph. * You are invited to prepare three reception reports for the broadcast on shortwave, mediumwave or FM of any AWR programming in any part of the world. You may choose the international shortwave programing from Adventist World Radio, via KSDA Guam, or any of the shortwave relay stations that carry AWR programming, or any of the 1700 local mediumwave or FM stations in any part of the world that are affiliated with Adventist World Radio. You may include up to three reception reports of AWR programing from shortwave sites that you have not yet verified. * Please do not send a recording of your reception; we just need your honest reception report on paper. All reception reports will be verified with a special contest endorsement. * Where possible, you are invited to include three radio cards for the Indianapolis Heritage Collection with your contest entry. These cards may be old or new, and they may be QSL cards, reception report cards, or picture cards of radio stations, etc. Not valid for this contest are amateur cards nor CB cards. * Well, there you have it, the details for our Wavescan 2016 “Grand Finale DX Contest”. This contest will run through the month of August 2016, and all contest entries should be postmarked at your local post office anywhere in the world on any date up to the end of the month of August 2016 and they should be received at the AWR temporary post office address as given below no later than the end of the month of September 2016. * Post your entry with all items to Adventist World Radio, remembering that neatness and preparation, will all feature in the judging procedure. Due consideration will also be given to the area of the world in which the contestant lives. * Where possible, please enclose return postage in the form of currency notes in any international currency, or mint postage stamps. Please note that IRC coupons are too expensive for you to buy, and they are no longer valid in the United States. * Please enclose your postal address label also. * The awards for the 2016 AWR “Grand Finale DX Contest” will be similar to all previous contests. There will be a special award for the world winner, one of Jerome Berg’s radio history books; and World Radio TV Handbook 2017 for each continental winner. In addition, there will be other special awards as well as AWR souvenirs and radio curios for many participants. * Each entry will receive the special postage stamp that commemorates the 200th anniversary of Indiana. * An additional ward is offered for an entry from Australia or New Zealand, a copy of Dr. Bruce Carty’s colorfully prepared History of Radio Broadcasting in Australia. * All AWR reception reports will be verified with a specially endorsed AWR QSL card. Please remember that it will take a period of many months, well into the new year 2017, to process all of the contest entries and reception reports, but each will in due course be processed. * Here is the only address for the “Grand Finale” Annual DX Contest: How Many AWR Shortwave Sites Have You Verified? This postal address is temporary, and it is open only during August and September 2016.